With V-neck on one side and round neck on the other, our lace reversible camisole offers two elegant looks! In soft nylon, this versatile layering white lace camisole adds charm to sweaters, jackets, blouses. 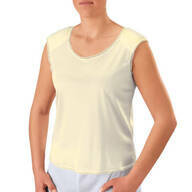 Nylon camisole is machine washable. Imported.